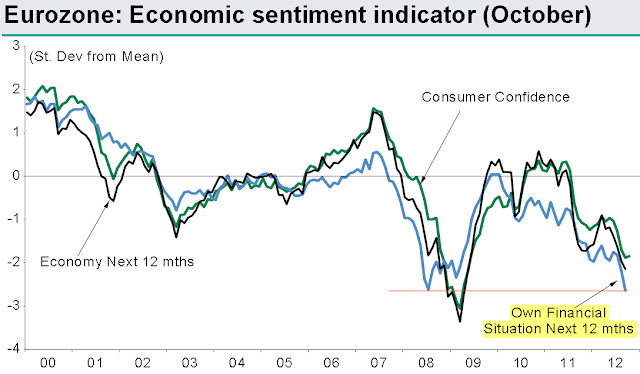 It is time once again to take a closer look at the latest Eurozone consumer sentiment and business conditions surveys. These measures tend to be leading indicators for the trajectory of corporate earnings and GDP growth. The first one is the Markit PMI. Markit: - The Eurozone sank further into decline at the start of the fourth quarter, with the combined output of the manufacturing and service sectors dropping at the fastest rate since June 2009. It is interesting to see the PMI numbers diverging from the GDP - the so-called "soft data" - "hard data" divergence (chart below). It is possible that the actual business conditions are indeed better than the business survey would suggest - it has happened before. But in most cases the divergence was temporary and by the end of the year we should see which was closer to reality. These weak business surveys are not just driven by the periphery nations. Germany's IFO Institute indicators are showing an unexpectedly worrying trend as well. Households surveys in the Eurozone paint a similarly bleak picture. The EC consumer confidence (which ticked up slightly), expectations for the economy, and particularly personal finances are all quite weak. In fact the expectation of "own financial situation in the next 12 months" touched the all-time low reached in 2008. Eurozone households have completely lost confidence in the sustainability of their personal finances going forward. With such weakness in business and the consumer sectors across the Eurozone, economists now turn to the German GfK consumer sentiment (2AM EST). The number is expected to be stable (expectation is 5.9) but there are clearly risks to the downside. FT: - A poor week for the German economy will focus more eyes on the latest data from the eurozone heartland, the GfK consumer sentiment index released on Friday. 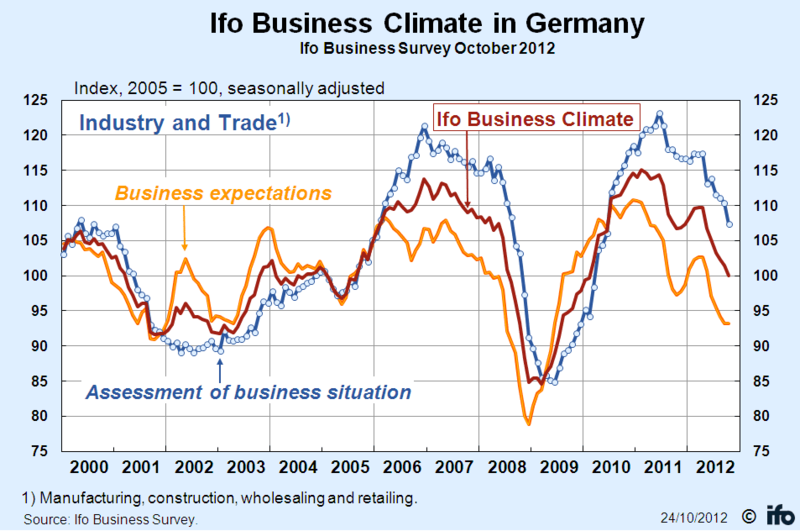 While stable numbers are expected from the German consumer, caution is the watchword after the surprise this week of the Ifo business confidence gauge hitting two-and-a-half-year lows and German PMI data declining for a sixth straight month. Could Germany become a bigger worry in the eurozone?